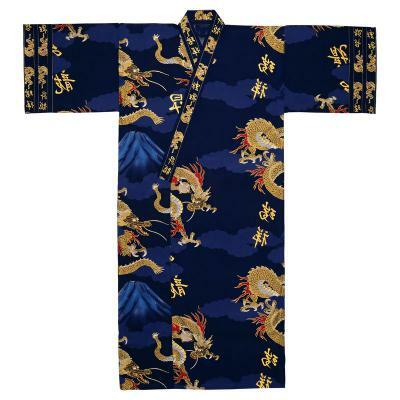 This men's Japanese robe, honors the symbolic dragon and Mt. Fuji, Japan's tallest mountain. In Japan, the dragon symbolizes wealth, wisdom and strength and is considered the master of all elements of nature. Majestic Mt. Fuji is a national symbol of Japan. Dragons and gold calligraphy accents are set against a navy blue background. Mt. Fuji is displayed prominently in the distance. This men's yukata is richly detailed and made of 100% cotton in Japan. A matching belt is included. Machine wash cold for best results. Available in three sizes: Medium, Medium/Wide, and XL. Medium, measures 58" in length and designed to fit a person 5' 8" to 6' 1" in height. The sleeve length is 15 1/2", the shoulder width is 28" and the girth is 50". Medium/Wide, measures 58" in length with a wider and roomier fit. This yukata is designed to fit a man 5' 9" to 6' in height. The sleeve length is 15", the shoulder width is 31" and the girth is 57". For shorter length versions of yukata, please see our selection of happi coats. To determine where the length will fall on you, measure from the top of your shoulder down the front. I bought this robe as a gift for my dad who lives in Florida and sits at the pool to read the paper in the morning. He loves it! He wears it when it is too cool to sit in just swim shorts.